Peek into Ponce with the Imagineers! If you don’t already know that the Imagineers work from Ponce City Market, then you must not follow us on Instagram. With our collective love of the community around us, food, drinks and events, we’ve found the perfect fit at Ponce, and want to take this opportunity to share some insider info on places you can’t miss while you’re here. Enjoy! Gifts at Archer: Archer Paper Goods, also known as The Merchant, is your one stop shop for everything from beautiful greeting cards, to paper goods, to small candles and gifts, to S’well Bottles (another Imagine Media favorite!). If there’s a holiday, birthday, or just an opportunity to send a friend Snail Mail, we suggest stopping into Archer. There’s truly something for everyone! Kale Salad at Brezza: Kale lovers, this is the lunch spot for you! Brezza is tucked back in the corner of Ponce, and its bright and beautiful atmosphere won us over upon first glance. Our personal lunch time favorite? Their Kale Salad. It’s deliciously crunchy and is mixed with house made dressing. Hands down the most delicious salad we’ve had here yet! Meat and Cheese plate at Bellina: Bellina is a beautiful restaurant as well, and not only offers traditional Italian cuisine, but also some really unique gifts for your next event. Our must-have here? 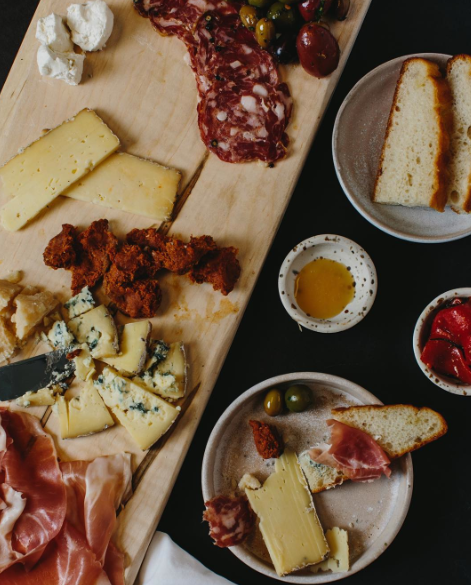 The meat and cheese plate! Grab a glass of house red and one of these plates for the perfect end to your day. To Go Margaritas at Minero: Did you know that ALL of the restaurants at Ponce offer alcoholic beverages to go, and the entire premises has its liquor liscence? Now none of us are party animals (maybe), but we do recommend heading over to Minero for an Estrellita to go. This drink is absolutely delicious, and makes for a fun side kick for your day of shopping ahead. Appetizers at the Mercury: The Mercury is a cocktail-focused environment on the second floor of Ponce City Market that we just so happen to pass every day on the way to our cars. Needless to say, it’s our first pick for a Happy Hour drink and appetizer! The drinks are absolutely delicious, and on top of that, their appetizer choices are delectable. Can’t go wrong with Crab and Lobster Fritters! Farm to Ladle Tomato Soup: We aren’t sure whose reading this, but what we are sure of is that you’ve never had tomato soup this good. Farm to Ladle’s Signature Tomato soup is creamy and delicious, and good enough to write 10 blog posts about. Absolutely a must-try! Grilled Cheese from King of Pops: And to Segway from Tomato Soup, Grilled Cheese is a necessary next step. King of Pops, known for their delicious and unique popsicle flavors, also serves varying grilled cheese concoctions that are perfect for a day when you need comfort food. Our favorite? The “Letter P”. Honeysuckle Gelato: And to end our favorites on a sweet note, don’t forget to stop by Honeysuckle Gelato on your way out or in! Honeysuckle is a long time Imagine Media favorite, and we were absolutely thrilled to visit their first location at Ponce City Market. And get this, you can choose to have your gelato in a cookie, brownie, shake, you name it. No choice isbad choice here, except choosing to skip the sweets. And finally, don’t forget to stop in and shop ‘til you drop at Imagine Media favorites Anthropologie, West Elm and Madewell! Thanks for reading and enjoy your new and improved view of Ponce City Market!